Too many marketers select accounts for ABM campaigns based on topical firmographic and technographic data. One B2B technology company I worked with selected Tier 1 accounts based on annual revenue, company size, and general technology usage. If an account was attached to a big brand name and used a competitor’s product, tens of thousands of dollars were spent trying to convert it into a marketing qualified account (MQA). During my three-month contract there, marketing never passed any Tier 1 accounts onto sales. Another company I worked with selected Tier 1 accounts using behavioral data. If an account matched the company’s Ideal Customer Profile (ICP) and visited product or pricing pages, the account was selected for ABM. 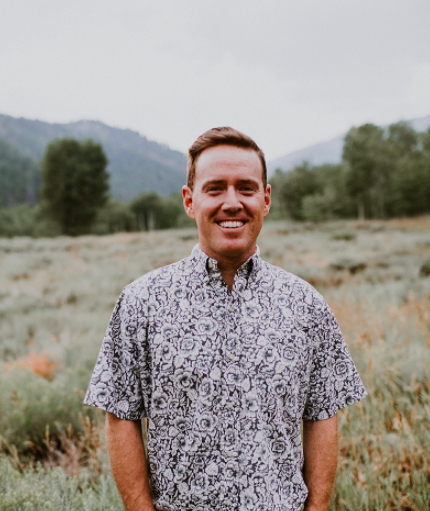 With this approach, every $1,000 spent on ABM resulted in roughly $8,000 of new pipeline revenue. This application of behavioral data made me curious about other data B2B marketers could use to select better accounts for ABM. 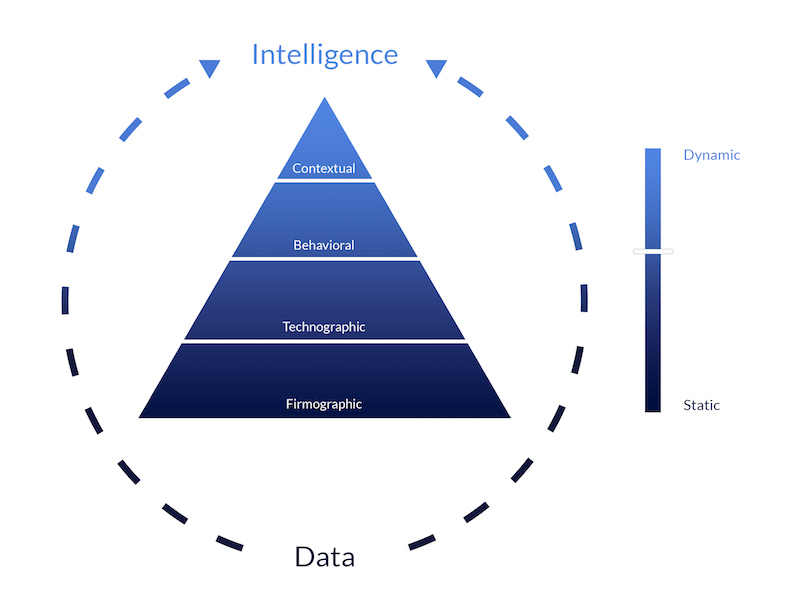 This led me to discovering account based intelligence. Account based intelligence (ABI) helps you determine a prospect’s likelihood to buy in real time. And of the four data types that support ABI, contextual data is the most valuable. Compared to technographic data that shows you if an account is using a specific web service or technology, contextual data shows you how an account is using it. For a technology company, this changes the game entirely. Below, I’ll show you how to use contextual data and ABI to select better accounts for ABM. Imagine you’re a marketer for a cloud service provider and received the green light for a pilot ABM program. To prepare for account selection, you meet with sales to define your ICP. This meeting occurs shortly after your services became HIPAA compliant and you signed a few well-funded healthcare startups. Because of this, you decide to target similar businesses. 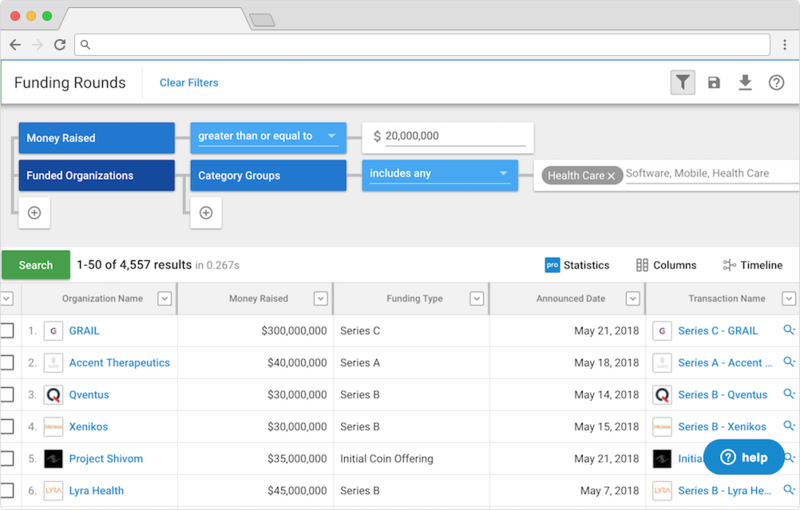 To segment your target accounts by industry and funding amount, you enrich your accounts with data from Crunchbase Enterprise. Dozens of startups in the healthcare sector appear that recently received funding. But the funding amounts that some startups received is much lower than others. Because the lowest recent funding amount of the healthcare startups you already signed is $20 million, you decide to segment further using that number as a minimum criteria value. ‍You can find firmographic data for your accounts using Crunchbase. 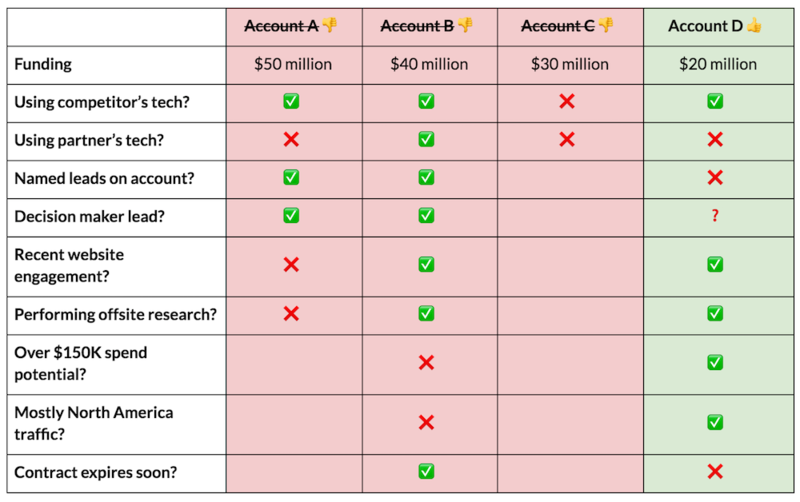 Assuming you can only select one Tier 1 account (the scale of this example is much smaller for the sake of simplicity), it would be unwise to select Account A just because it received the most funding. To find out which account has a higher likelihood of converting, you dig into the technographic data. During your sales and marketing meeting, it was agreed that the ABM campaign would support sales for the company’s HIPAA-compliant cloud hosting product. It was also agreed that the ABM campaign would target accounts using a specific competitor that has received complaints about its HIPAA compliance. To find the companies using our competitor, you enrich your accounts with data from Intricately. This data shows that every account besides Account C is using your competitor. For this reason, you remove Account C from consideration for this campaign. ‍You can use Intricately’s free app to build smart lists of companies using a competing or complementary technology to select the right accounts. After removing Account C from consideration, you apply the technographic data another way. Since you have a strong partnership with a content delivery network (CDN), you investigate which accounts are using that specific CDN. You have referred millions of dollars of business to this partner so they’re likely to help you close some deals. Using Intricately, you discover that Account B and D are using your partner’s CDN. This discovery makes these accounts stronger, but not strong enough to rule out a better-funded Account A. To narrow down accounts further, you proceed to analyze behavioral data. There are two different types of behavioral data we’ll analyze for this example: on-site behavior and off-site behavior. On-site behavior shows how accounts are interacting with content (which content they viewed and when they viewed it). Off-site behavior shows whether accounts are researching your product — or products like yours — on sites you don’t own. Your marketing software will help you determine which accounts are most engaged with your content. Here you’ll look at the number of leads associated with each account, the decision making power of those leads (job title), and the recency of activity on your website. Note: Selection can be accelerated with lead scoring (a great checklist by Marketo). You have a few leads for Account A and B. Using DiscoverOrg you identify that a previously-nameless lead at Account A is the VP of Technology. She and some people she manages have consumed a lot of content on your site but not recently. Account B has fewer leads and no decision maker but on-site activity is as recent as today. There are no leads for Account D but you aren’t ready to ditch it just yet. Even though employees at Account D didn’t fill out a form and become a named lead, they may have visited your site. To see if this is the case, you use a tool like Leadfeeder that can identify companies attached to anonymous web traffic. But you’re not done analyzing behavioral data just yet. According to research by Google, B2B decision makers perform an average of 12 searches before visiting your site. Searches bring them to articles on industry publications that teach them about products, to public forums where they ask questions about products, and to sites like G2Crowd where they read reviews about products. Because of this off-site behavior, there’s a number of providers collecting this intent data. One such provider is Bombora. 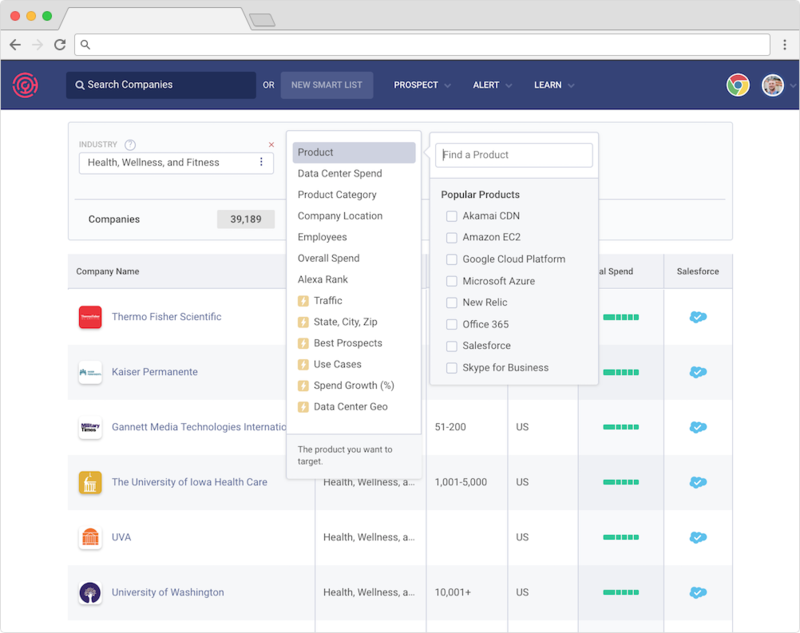 With data collected from its data co-op, Bombora shows you which companies are interested in you before they ever land on your website. Using Bombora, you learn that Account B and D are actively researching new web hosting solutions and that Account A is not — or if it is, there is no intent data that proves this. After analyzing both on- and off-site behavior, you decide to remove Account A from consideration. This is a tough decision given its large amount of funding, but the data shows that your ABM campaigns are more likely to resonate with Accounts B and D.
At this point many marketers would choose Account B as the winner. So far it has checked every box. The only problem is that you don’t know the true spend potential of each account. Even though Account B has more money to spend, is it the most likely to spend more money on you? Contextual data can answer this. How much is the account spending on my competitor’s solution? Which region is most content being served to? When does the account’s contract expire? Is monthly usage/spend increasing or decreasing? At what rate is this company growing its overall spend? What use cases is this company prioritizing? For the purpose of this example, we’ll answer the first three questions using the free version of Intricately. In a matter of seconds you discover that Account B is spending $100K per month with your competitor on hosting and 60% of web traffic is coming from EMEA. Account D, on the other hand, is spending $200K per month and 90% of traffic is coming from North America. ‍Example of account profile inside Intricately (Nike): First click shows total cloud service spend; second click shows traffic served by region; third click shows estimated monthly spend for various cloud hosting providers. After looking at the profiles of each account in Intricately, you use Intricately’s free enrichment tool to discover when each account’s contract might expire. You see that Account B started using your competitor 22 months ago and that Account D started 18 months ago. Assuming each account has an annual contract with your competitor, it’s likely that Account B's contract will expire sooner than Account D's. At this point Account B checks off more boxes on the list. But because your ideal customer has a monthly spend greater than $150K and most of your servers are located in North America, you choose Account D as your Tier 1 account for the ABM campaign. Bottom line: Even though Account B has more funding, it does not have higher spend potential. And even though it checks off more boxes on your list, not every checkmark is worth the same. Checkmarks further down the list are based on data that is higher on the pyramid of account based intelligence. Be data-driven. Move past basic firmographics and technographics. This example illustrates the upside of being data-driven in an account selection process. A campaign's success hinges on analyzing data and choosing the right accounts, which aren't always the ones attached to big brand names. This example also shows that proper targeting relies on much more than firmographics and technographics. While this type of data is useful for segmentation, it’s not nearly as valuable as contextual data that sheds light on true spend potential and propensity to buy. What types of data do you analyze when selecting accounts for high-spend ABM campaigns? Let us know on this LinkedIn thread. We’d love to hear from you! Team Intricately is headed to SiriusDecisions Summit 2019! See what we’ll be up to including our case study with Snowflake and our $1,000 cash giveaway. Understanding your market’s landscape is tough. Here’s our list of the top market research tools in 2019 to help guide you to the right path. Discover the top account-based marketing tools in 2019 to help your sales and marketing teams identify accounts, launch campaigns, and measure your success. © Copyright 2019, Intricately, Inc. All rights reserved.